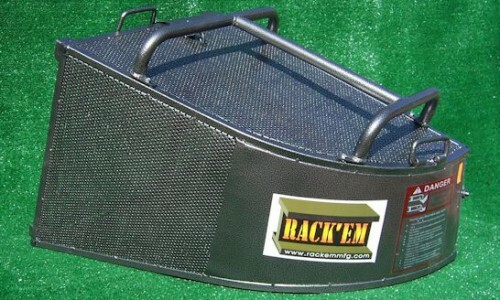 Rack ‘Em has America’s most complete line of grass catchers and trailer accessories. Rugged steel grass catchers are designed for commercial use. Durable “hammered” powder coat paint that looks great and wears like iron. Tough welded frame with gussets at key stress points. Oversized finger ring on the door latch for easy operation. Rack’em Manufacturing is well known as America’s most complete line of equipment handling racks for both Open and Enclosed Trailers. Their racks are perfect for work and sport trailers, or general storage organization. 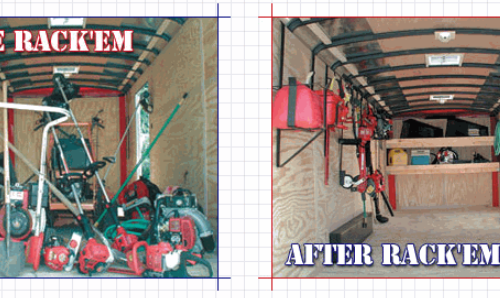 The line consists of trimmer racks, back pack blower racks, trim line holders for both open and enclosed trailers, grass catchers, extensions and more.